This book continues the conversations from Book 1. Find out how these characters have fared since you last read about them. 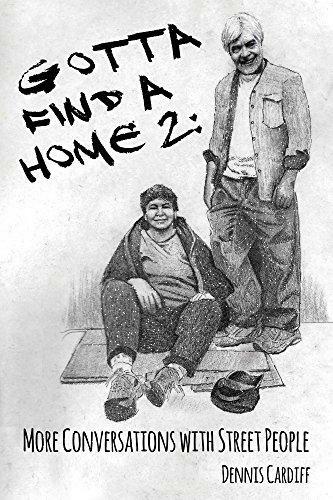 Writing about the homeless and helping the homeless, has given my life a purpose that it didn't have before. Documenting their stories will, I hope, introduce them to the public in a non-threatening way. Some panhandlers look intimidating, but that disappears when one sees them laugh. A typical day for me involves taking the bus and walking two blocks to work. I pass Joy's spot every day. I usually sit and talk with her for twenty to thirty minutes. Chester and Hippo may drop by to chat. Most afternoons, depending on weather, I walk two blocks to the park where the group of panhandlers varies in size from two to twenty or more. They don't panhandle at the park. Like a soap opera, every day is different; some scenarios will carry over a few days or weeks. People will disappear for weeks or months due illness, rehab programs or incarceration. When I met Joy I was going through an emotional crisis. Meeting her and her friends - worrying about them and whether or not they would be able to eat and find a place to sleep - took my mind off my problems, that then, seemed insignificant. It was - is - truly a life changing experience.